Yes .. here I am! back in Dameisha home away from home. The snapshot of the flight recorder on the plane shows we flew over the Alution islands by Alaska, then skirted by the Kamchatka peninsula before making our way down to Hong Kong. 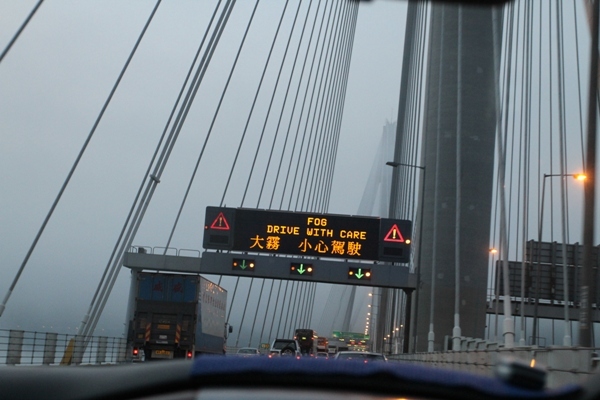 Traffic was heavy all the way from Hong Kong and through Shenzhen and the fog didn’t help .. so it took two hours from the airport to get here. Anyway, better go to bed .. busy four days at work ahead of me. I started working on the plane already, but they took good care of me with food and drinks, and I got to catch up a little on my sleep as well. 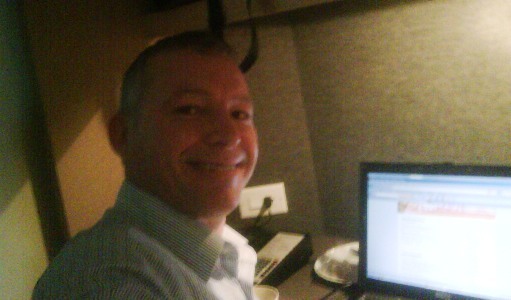 Sitting in the lounge at San Francisco airport, will soon step on board for the long flight to Hong Kong .. I’m tired ! since I got only 2 hrs of sleep last night. I will get in on Monday night Hong Kong time, and this time it’s just me and one colleague that will be picked up by the van that will take us out to Dameisha. It’s 11.30pm, and my 3.45 am pick-up time for the airport is approaching fast, given that American clocks all ‘spring forward’ by an hour tonight at 2am as well! Eek! I hope the cab driver adjusts his watch as well ! I still had time to squeeze in watching Up in the Air at my friends Bryan and Gary’s, the movie that stars George Clooney as an über frequent flyer, corporate down-sizer and motivational speaker. The movie had an engaging storyline and certainly flashes a warning sign to all frequent flyers : make sure you have a home and people to come back to when it all comes to a very sudden halt. So noted. Cleaned my house today, and started packing my bags for the trip out to Hong Kong, my 3rd, Sunday. 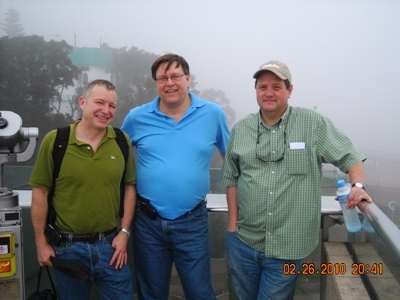 A group of about 8 of us from work plan to go to Macau next weekend (the former Portuguese colony, now a Special Administrative region of China the same way Hong Kong is). 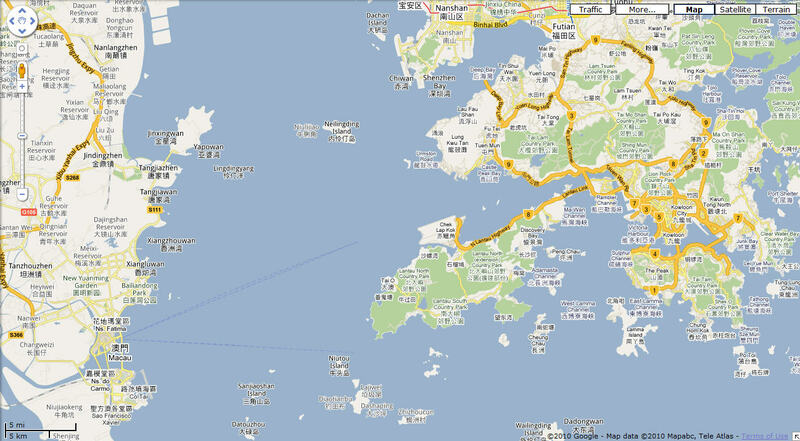 It is across the Pearl River Delta from Hong Kong (lower left corner of map, click picture to enlarge, picture courtesy of Google Maps), and we plan to take a ferry from Shenzhen airport to get there. 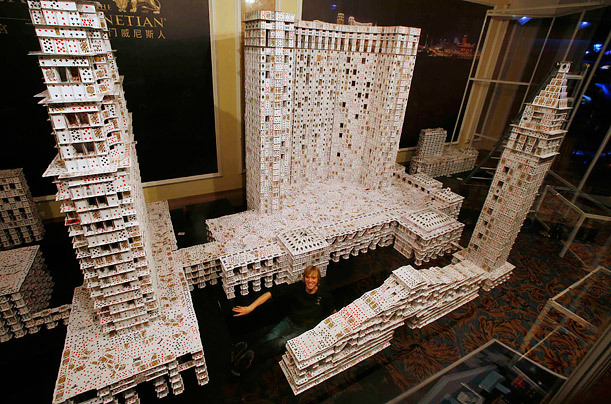 I couldn’t resist posting this picture of a house of cards .. check it out. I suppose it will be gone by the time we get there next week! So .. what was I up to Thursday? Had my hair cut, had my ‘chompers checked’ (well, cleaned and checked) at the dentist, with the next one already scheduled for September. 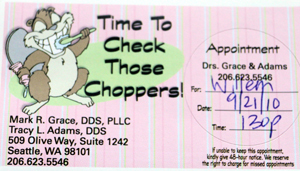 The hygienist that was assigned to me talked non-stop, and of course I just say hmm and hm-mm. She volunteered to clean the Seattle Zoo’s gorilla’s teeth as well but said several other volunteers were already lining up ! 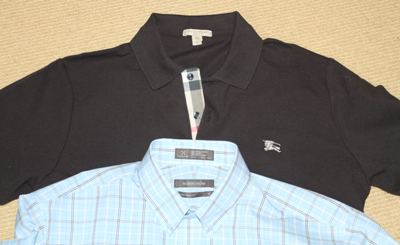 I also bought up two new short-sleeve shirts for work, trying to make sure they are dressy enough. 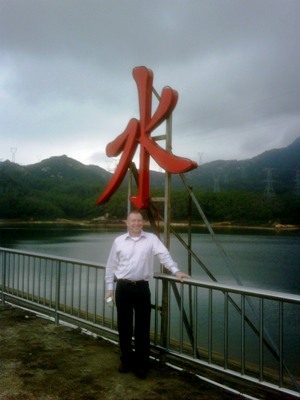 I’m not used to wearing short sleeves for work, but it’s going to become uncomfortably hot and humid in Daya Bay very soon. Three of us went to see Alice in Wonderland .. the epic 3D fantasy adventure from Walt Disney Pictures (director Tim Burton) and with Johnny Depp and Helena Bonham Carter. 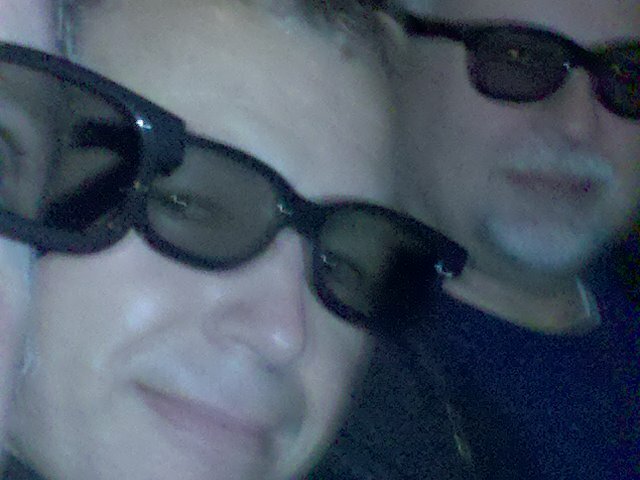 The picture was snapped in the theater by my friend Bryan : ). We all thought the 3D effects were underwhelming, though. The movie had its moments, and some good underlying messages, but I for one didn’t quite expect Alice to turn into a Joan of Arc like character battling a fierce creature towards the end. 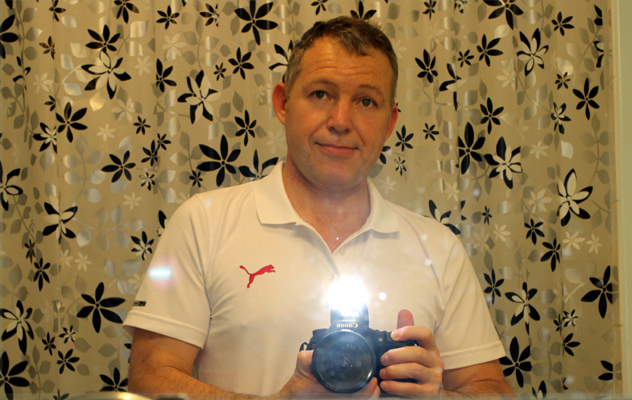 So how about modeling a nice Puma shirt I got in Hong Kong? (only US$20). Like it? I have always liked the jumping puma logo. 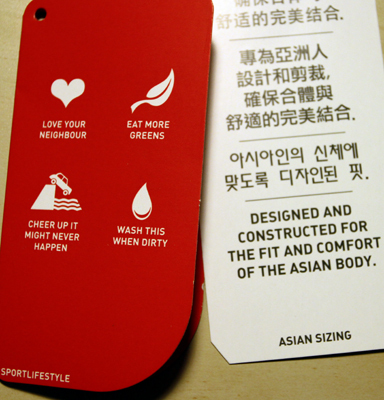 The best part is the clothing labels that come with it .. ‘Designed and constructed for the fit and comfort of the Asian body .. evidently I have an extra-large Asian body ! 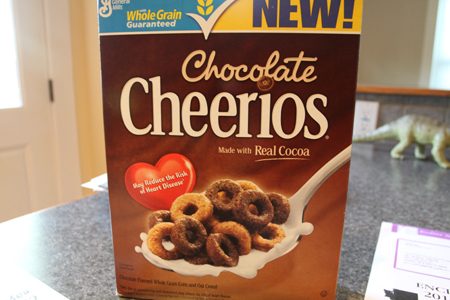 Two things from my kitchen counter top this morning to brighten up the cold Monday .. General Mills’s latest Cheerios flavor is chocolate, with real cocoa. Hmm, so there is such a thing as imitation cocoa? and how much is ‘real cocoa’ and how much brown food-coloring? 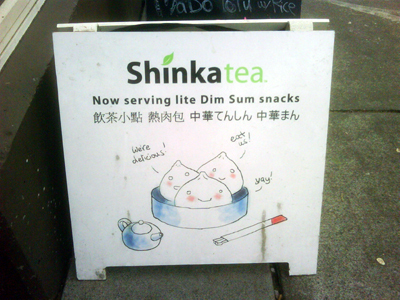 It tastes so good that it makes me feel guilty, though. I should eat oatmeal or Pronutro instead ! 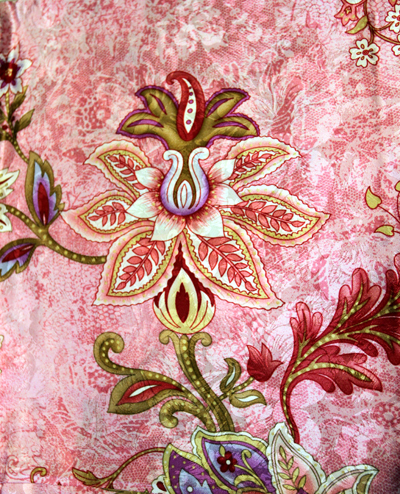 The other picture is of one of three cuts of silk fabric I bought in Hong Kong (now making its way to Stellenbosch, South Africa). Saw this on the sidewalk on the way to Starbucks to get some coffee this morning.. hmm ! 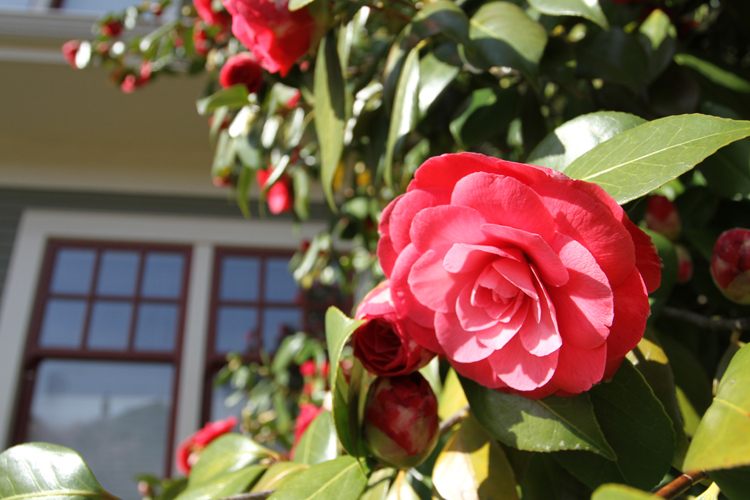 The rhododendron in front of my house is in full bloom .. the only color that I have in my small front yard at this point. I will have to do something to it, but of course not being home a lot makes it complicated (sigh). Bed-time for me, I got a fair amount of sleep last night and I hope to do even better tonight. 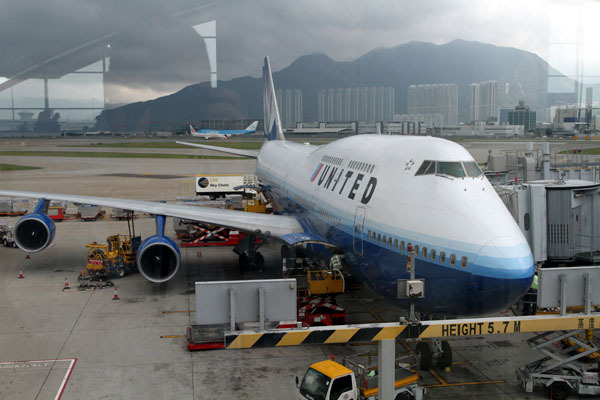 Below is the Boeing 747-400 bird that brought us across the Pacific sitting patiently on the tarmac. (Notice the phalanx of apartment buildings in the background?) 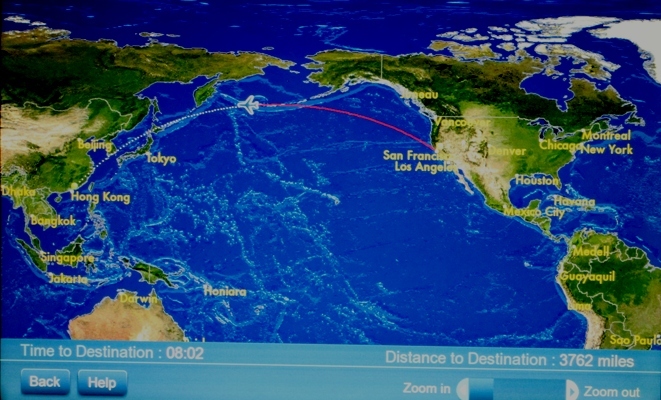 The flight and connection in San Francisco went fine; I made it in around 2pm to my house. It was a beautiful day in Seattle, sunny with some clouds, 60° F (16 °C) and the trees on my street are full of spring blossoms. I see construction has started in earnest on the light rail station here on Capitol Hill (where I live). The newspaper says Starbucks is stuck in the crossfire for allowing guns in its stores. I am not sure if this was a change in the previous policy, or how the controversy came about. (Gun ownership by citizens is illegal in all of China.) I will have to catch up with the local and national news here ! And catch up with my sleep. I am going downstairs for a nice breakfast and then the hotel shuttle will take me to Hong Kong airport. I snapped this picture looking back from the van that brought us here from work yesterday. 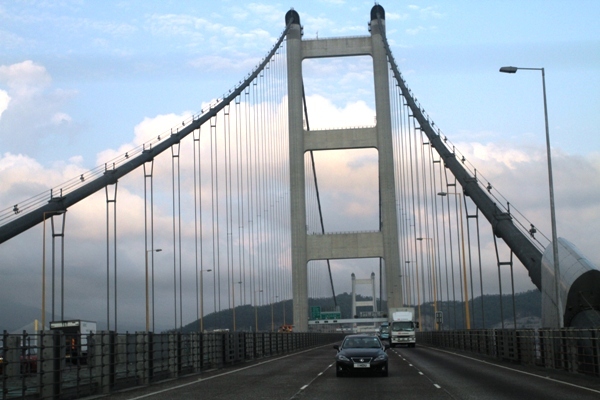 It’s one of the two suspension bridges that runs across Victoria Bay and connects Kowloon and Hong Kong Island. Below is another ‘spot the translation faux pas‘ picture, of a paper shopping bag on the counter at the dry-cleaners last night when I dropped off some shirts and pants. Those of us that go home are all packed up for our trip back to the States already, since we’re going to stay overnight at the Hong Kong airport hotel. Always, always check the Big Three : passport, wallet and Blackberry. Then almost as important there’s the cell phone charger, computer, charger, medicine, iPod and Bose head phones ! (Yes, I know – I have too many gadgets). 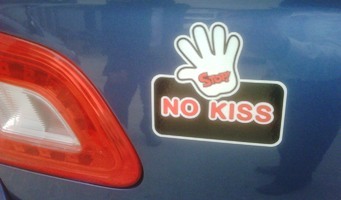 These pictures from a car parked here at work .. the Chinese bumper sticker equivalent of ‘back off!’. My colleagues tell me the second picture (same car) is more rude than the first one, roughly translating into ‘I was a bad boy at school so watch out for me!’. To look up these characters on my translator is a mini-project : I have to scribe it the right way with the stylus, and some of them are just impossible to get right. Monday is over and only Tuesday and Wednesday stands between me and Thursday. I’m going home on Thursday! I can’t wait! 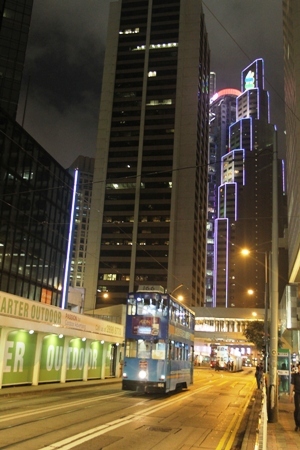 This picture was taken in the Tsim Sha Tsui district in Hong Kong on Saturday night. An Indian restaurant, a kitchen house ware store, 24 hr internet cafe and .. hel-lo! 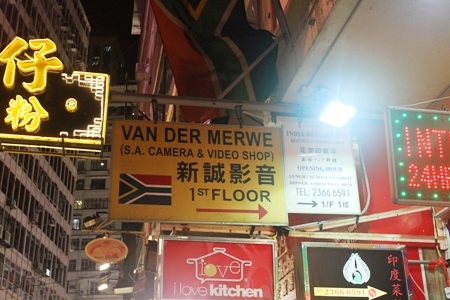 Van der Merwe’s Camera and Video Shop! South African flag on the sign and above the sign, see it? Background note to non-South Africans : Van der Merwe jokes make fun of Afrikaners , Van der Merwe being a stereotypical Dutch name. Is this joke too risqué? Too late, here it is. The doctor wanted to go hunting, he calls his assistant Koos van der Merwe and tells him ‘Yes Koos, I am going hunting tomorrow, we don’t want to close the clinic, and I ask you to take care of our patients’. ‘Yes, doctor …’ answers Koos. The first one had a headache so I gave him TYLENOL. ‘Great Koos, and the second one?’ asks the doctor. ‘The second one had an upset stomach and I gave him MAALOX, doctor’ says Koos. ‘Yislaaaaaaaik Koos you’re good at this and what about the third one?’ asks the doctor. And what did you do Koos? !’ asks the doctor. I need a t-shirt that says ‘I love Hong Kong’, because I really do ! Bowl-shaped viewing deck of the Peak Tram BUT there was only FOG to view (co-workers Vic and Karl with me); we had a good laugh about that! The view has been like this for two weeks, said a guide, so that made us feel better. 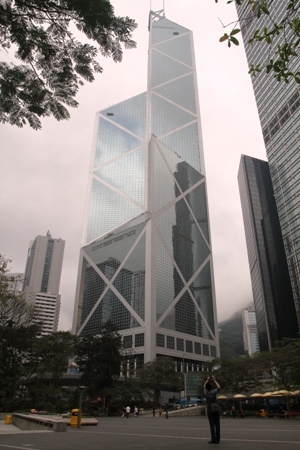 The Bank of China building in the Central district on Hong Kong Island is spectacular up close. 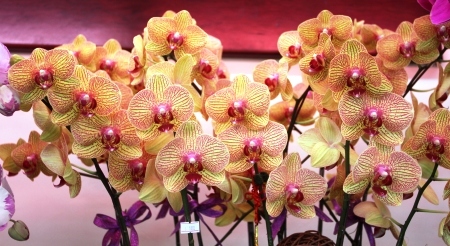 Orchids on Flower Market street in Kowloon, they go for US$10 for a flower pot with the plant spectacularly in full bloom (I saw South African proteas for sale as well). Birds in cages in the bird market right next to it. A mind-boggling array of street vendors selling brand names, off-brand names, wanna-be brand names in t-shirts, toys, gadgets, underwear, housewares, electronics, you name it, it’s there. 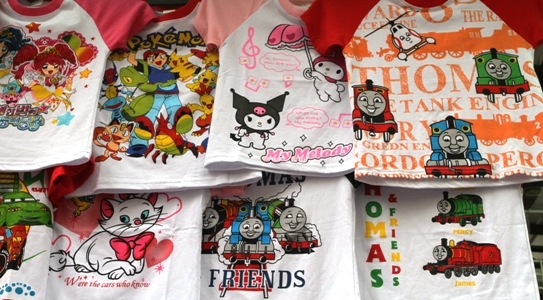 The t-shirt with the kitten character Marie from the Disney classic Aristocats flanked by Thomas and Friends and others. Goldfish in plastic bags outside an aquarium store. The high-end stores have stunning neon-lit displays of sea anemones, sea cucumbers, star fish and even coral for sale that matches the best scenes I have seen anywhere! 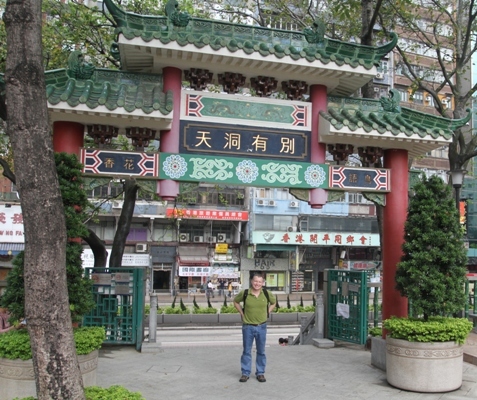 A park off Nathan road in Kowloon where retired men played Chinese checkers and mahjong. Then we walked south on Nathan road, and Karl bought some pearl arm bracelets; I bought more gold (yes, another one, somebody – stop me! .. it was a very small item, though). Then we were accosted like the tourist guides all warn, by the tailors that solicit business on the street. What an interesting experience to go into the tailor shop – a long story, but I ended up ordering three custom-tailored shirts which were delivered at the hotel and run all of $40 each. They fit very nicely. 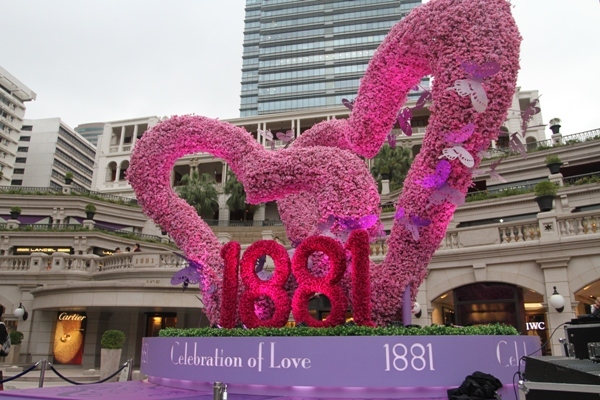 Further south is Salisbury Road on the Kowloon waterfront with Hong Kong designer Vivienne Tam’s store 1881 about to open (the heart-shaped flower display in the picture); a store at that plaza sells Vacheron Constantin watches – which I have never heard of – and a stunning gold and diamonds watch with a dragon design was on display. 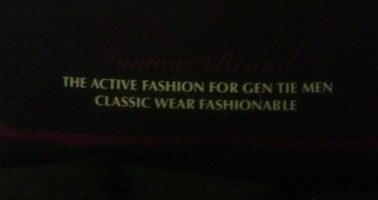 I had the nerve to ask the salesperson the price. It goes for a cool HK$ 546,000 (US$70,000). 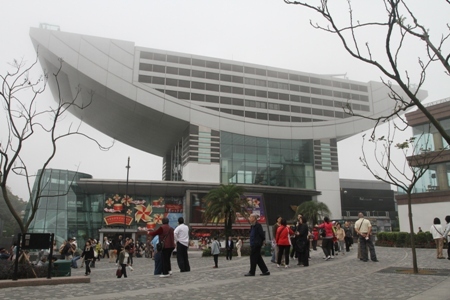 The next stop at the Chinese Center for Arts and Culture is the one and only place any visitor to Hong Kong must go to. 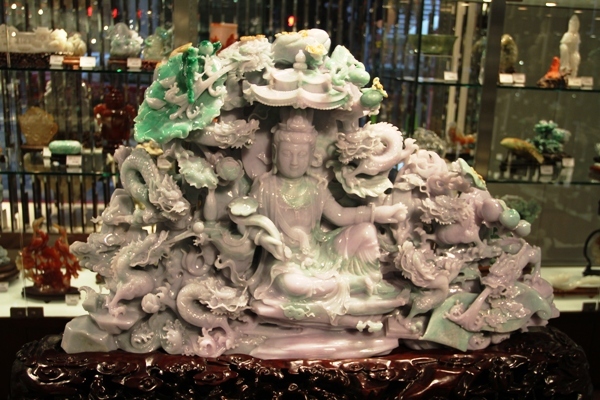 Pictures are forbidden, but I took the one shown of a carving, maybe it’s a block of jade, I don’t know. Some of the antique carvings in bone and ivory there make the word exquisite fall completely short as a description of it. Next we got on the Star Ferry to cross Victoria Bay back to Hong Kong Island (skyline from the ferry). 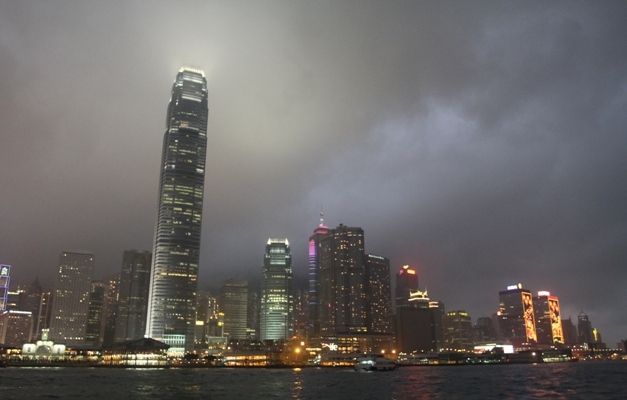 The tall building is Two International Finance Center, the tallest building in Hong Kong. The next picture shows two of my favorite night scenes : a tram and a building outlined in neon. 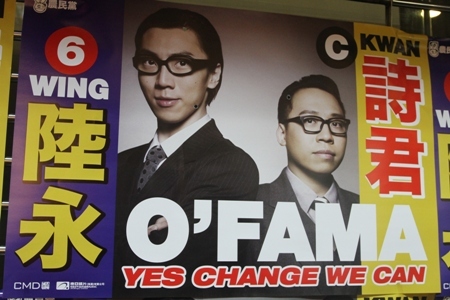 And as far as I can tell the O’Fama group is a local band. This morning a blanket of fog enveloped the whole area; it is amazing how warm and stuffy it got from just one week ago when we were sitting here in the office building shivering from the cold. 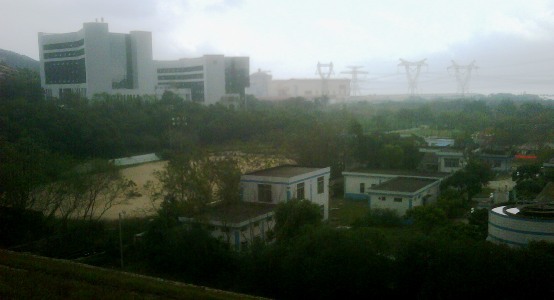 The marble floors and door thresholds – and even windows – in the building ‘sweat’ – all the moisture condensing on it. (Bad to have slippery marble floors, so they had to put mats in all the lobbies and hallways). Yesterday a few of us walked up to the reservoir close to the office building here where we work (picture below of the gray and black office building on the left with the nuclear power station behind it). But hey! it’s Friday and I have a Hong Kong weekend ahead. The Courtyard Marriott hotel room waiting for me there is the Lap of Luxury, and I am going to SNOOZE in that king-size bed with the six pillows ! Thursday, mercifully the week is drawing to a close. We have an ‘all-hands’ meeting this afternoon which means I get to sit on my tush and not stand up front trying to control a discussion with a room full of 20 people. 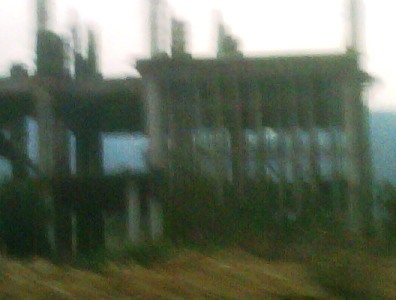 The blurry picture below is of hundreds of building skeletons we see each morning on the way in here .. which seems like a shockingly inefficient use of capital given that there must be plenty of people in China needing housing, businesses needing infrastructure, communities needing schools and hospitals and all that. 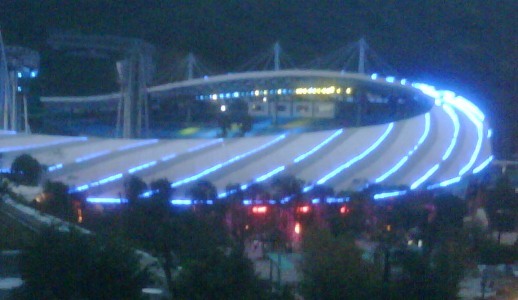 The picture below that is of the Bird’s Nest-like entertainment stadium from the Outside China Town theme park where we were just this weekend. I snapped the picture from over the wall of the apartment complex when I went for a walk one night : it’s that close to us ! 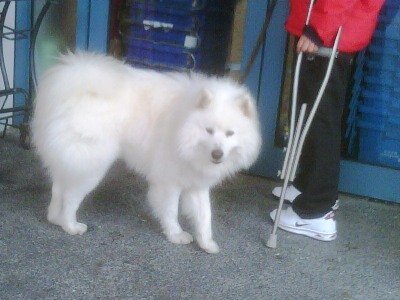 Beautiful dog here at the complex — I have to confess I thought Chinese people were not really dog-lovers, but there are quite a few to be seen with dogs here in the apartment complex. And put some PREMUIN ONLY fuel in your car! .. sticker spotted on a car here. Another day of work session facilitating for me – half of it in Chinese with me waiting patiently for the Daya Bay team animatedly discuss some design issue before them. Then I get a translation from the team lead or my Chinese colleagues, and depending on my answer back they settle down or debate it a little further : ). 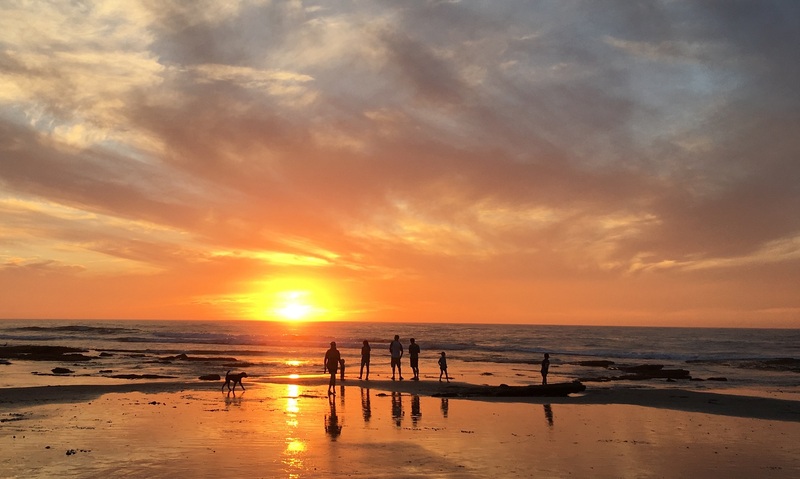 It’s tough for me, and tough for them : some are seeing SAP for the first time – in English – and they are not familiar with the terms or the processes. But as always it’s packaged software, offering some choices but not total freedom to redesign it, which helps me to just say : ‘Well. We cannot change it, that’s the way the Germans designed it”. The picture is from Sunday on the mountain, of course. 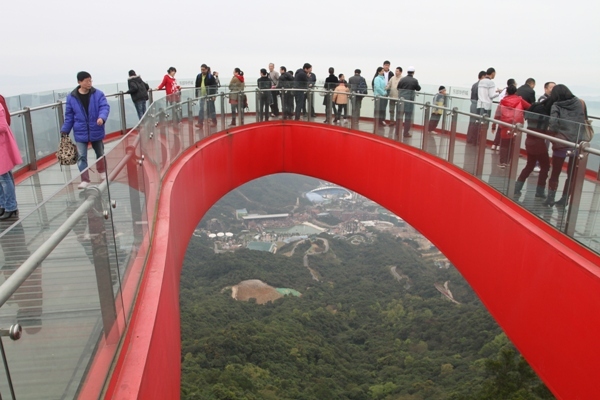 A little walkway over the cliff with a glass floor. Tread carefully !